When a customer drives into the service department with a genuine lemon, it can take me and my people a lot of time and energy making phone calls and finding the places to exert pressure to make that car right. I take care of customers who have problems. I don’t make a customer pay more for that kind of quality service. He gets it no matter how good a deal he gets. I don’t write down on his card that he bought cheap from me and that I don’t have to do anything else for him. Everybody gets the same quality of service from me. I think that should work in any field. If I buy a suit during a sale, I expect it to fit as well as if I bought at the top price. And if I get the feeling that they are trying to avoid doing enough alterations to make the suit fit, I’m going to lean on them to get it right. And I’m going to remember their treatment when I want another suit. That gets us back to lemons. They can happen. They don’t happen very often, but they do happen. One car can need adjustment to the transmission, another one has a piston that doesn’t fit its cylinder, and another one has a faulty gear in the rear axle. They can catch and fix that stuff pretty easily. But what happens when once in a couple of hundred thousand times it all happens to the same car? You get a lemon. You come in with one thing wrong and it gets fixed. Then a few days later another thing goes sour, and your back. In a lot of dealerships, their attitude is: Here comes that creep again. Well, let me tell you that when a guy gets a lemon, the only creeps are the people who won’t do right by him. It is not easy to take care of lemons. I keep on very good terms with the people in the service department, buying them coffee in the mornings, gifts when their wives have babies, and things like that. But those are business expenses, because I mean business when one of my customers comes in with service problems. I always make sure my customer gets what he is entitled to, and so should you. All this costs me money and takes a good piece of time. But I don’t think I have a choice. Just think about somebody lying there in a funeral home, and watch all the people coming in to pay their last respects. Think of the pulling power of that one guy lying in that satin lined box. And there will be about 250 more people going to see their friend for the last time. Everybody has that kind of pulling power, and none of us in the profession of selling can afford to jeopardize one single customer, because of those 250 people his life influences. I sell something that hundreds of thousands of other salesmen sell. They’re all a like right? Wrong! A car sold by Joe Girard is not just a car. It is a whole relationship between me and that customer and his family and his friends and the people he works with. About 250 people. I’ve been telling you how important the after sale phase is. I’ve told you how I always send a thank-you to every customer. I’ve given you some idea of how I take care of my customers when they have service problems with the cars I have sold them. So you get the idea that I stay with them as much as possible. It is a lot more pleasant to be nice to a customer than to treat them like mooches and run and hide when they come in with troubles. 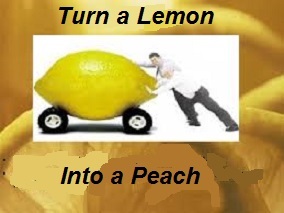 Make any lemon into a peach for your customers and you will make more money by making your customers believers.